1) There can be as much as a 60% difference in rolling resistance between tires - albeit at the loss of traction and/or treadwear. Careful selection of tires can yield a good compromise. 2) Using a wider and larger diameter tire can improve RR by 6%. This might have additional benefits as the effective drive ratio is also reduced! 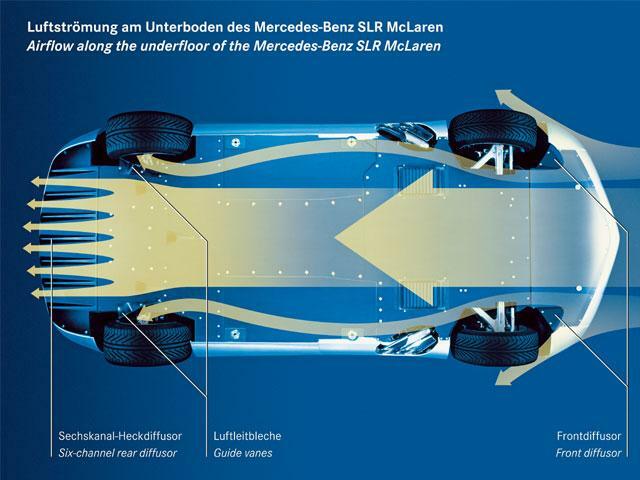 In spite of an increase in aerodynamic drag of the wider tire, the drag is more than offset by the improvement in RR. Caution! There may be some problem with rubbing on fenders, frames, and suspension components. Check and make sure you know the situation - keeping in mind that the worst condition is fully compressed AND with the steering wheel fully turned! 3) Inflation pressure has a lesser effect: 10% for the first 8 psi - and diminishing after that. Be aware that increasing the inflation pressure also decreases the size of the footprint. While it seems logical that a decrease in footprint size ought to lead to a reduction in traction, and have some adverse effects in treadwear, there just aren't any studies to help clarify the situation. In this case: No news is No News! I urge caution! This is a followup page. 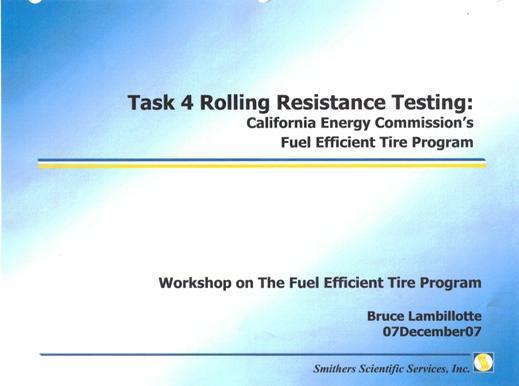 It has been several years since I wrote the first page on rolling resistance and fuel economy. Several things have happened and this page is to provide additional information based on those developments. I don't exactly what the commission asked for, nor do I know what was said during the presentation, but some of the charts are pretty obvious. This is a graph of 380 P195/65R15's (and I assume 195/65R15's) that were collected and measured for rolling resistance. It doesn't say what particular test was performed, and I assume the same testing procedure was used for all of them. I can see that there were 76 different tires tested, which means 5 of each. But what is important is that there is a wide range of values and they form a pretty decent bell shaped curve - which is what would be expected. What is also important is that the range could be expressed as the average ± 25%. This is a HUGE range - pointing to the fact that careful selection of tires can have a profound effect on rolling resistance. Please note that later in the presentation are some analyses to determine if there are factors that can be used to determine what is driving the rolling resistance. They looked at tread depth, weight, diameter,UTQG Treadwear Rating, price - and they could NOT find anything that correlated well. As a note, tire engineers are aware that the amount of tread rubber and the exact nature of the tread compound is generally considered to important - AND - that the treadwear and traction characteristics of the tread compound are tradeoffs for RR. That would explain why they didn't find anything that correlated - It's a 4 factor correlation! 220 P265/70R17's with a range that can be expressed as the average ±25%. 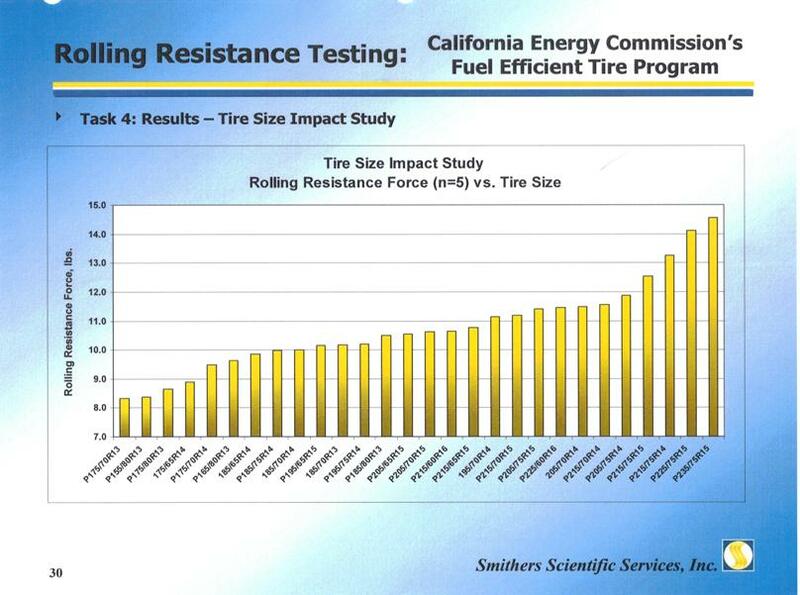 Again, there was no relationship found between rolling resistance anything else. 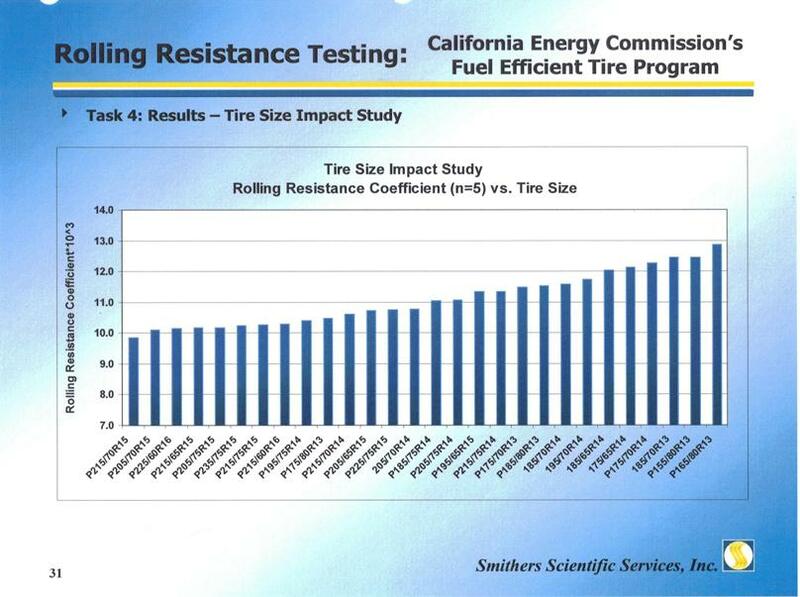 Smithers also looked at the effect tire size has on RR. The data is graphed below. I am not sure where I picked this up, but all these tires are Goodyear Integrity's. That presents a problem in that some of these tires are OE, while most of them are replacement. What that means is that some of these tires were designed to the same design characterisitcs (traction, treadwear, etc.) and some are individuals designed to the specs selected by a vehicle manufacturer. That means there should be outliers! When tires are measured for RR, one of the test conditions is the load - which would be larger for larger tires. But when a tire is applied to a vehicle, the load on the tire would be the same, regardless of what tire size is used. 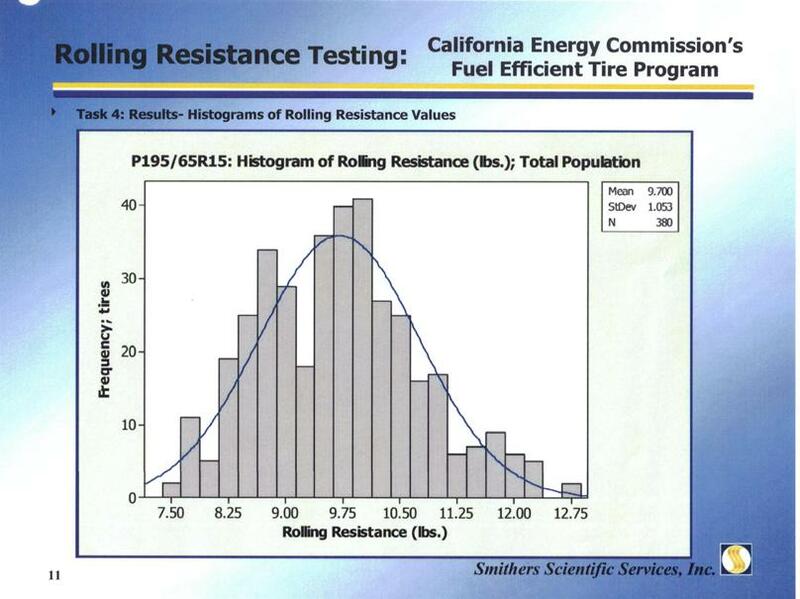 So the RRF (Rolling Resistance Force) needs to be divided by the test load to get RRC (Rolling Resistance Coefficient) - which is shown below. This is the same data, only expressed as RRC (Rolling Resistance Coefficient). Notice that the larger the tire (generally), the smaller the RRC. What that means is: If you apply a larger tire to your car (and use the same inflation pressure), then this results in lower RR and therefore better fuel economy. Remember I said that these were Goodyear Integrity's - and that some of them were OE tires? Let's see if we can pick them out. What I would be looking for are data points on the low side and far away from the average (the line) - and while I find some, the associated tire size is not likely to be an OE size. (Sep 2010) Please note: EVERYTHING from this point down has been revised! It occurred to me that while I, as a tire enginner, pay a lot of attention to load carrying capacity, this way of thinking is not the way most folks think of tires. The average guy tends to think in terms of "size", so I redid the regression analysis only using the 3 parameters normally associated with "size": Section Width, Aspect Ratio, and Rim Diameter. Note that the expression starts off with a constant and all 3 of the parameters subtract from the constant to get the RRC value. This means that going up in any of those dimensions results in a DECREASED value of RRC. Put another way: Larger is better! One of the reasons I (and other tire engineers) tend to think of tires in terms of load carrying capacity has just been demonstrated. Every one of those 3 parameters has major implications when load carrying capacities are calculated. It may seem counter-intuitive to think that a wider tire, with its additional mass in the tread area, could improve fuel efficiency. However, this data says otherwise. One possible explanation would be that while the width goes up 10mm, the width of the tread (an important dimension for RR) goes up a fraction of that. 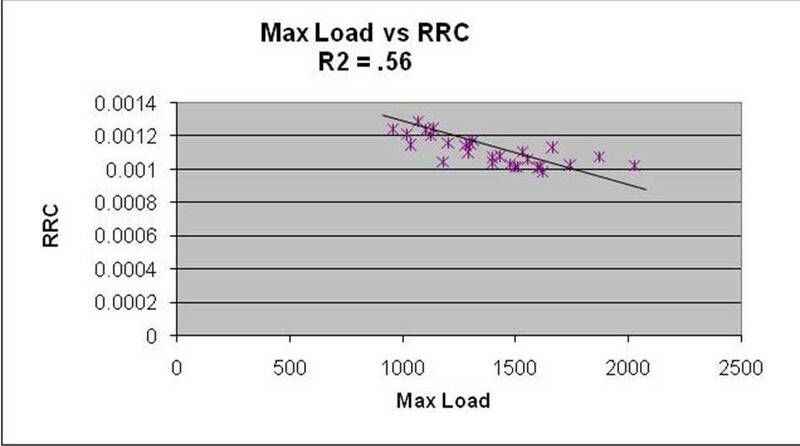 The net effect is that while the load carrying capacity goes up directly as a result of the increased width, the RR would go up less than that. Put another way, the width of the tread in a tire is not 100% of the section width and it is common for tires to be designed with tread widths expressed as a percentage of the section width. So assuming the tread width is 70% of the section width (a reasonable assumption), that would mean the tread width increased 7mm while the width of the tire increased 10mm. 10 mm wider results in a reduction of about 2%. My experience is that you can only go about 20mm wider before you start to interfere with the fenders, frame, and suspension components - and that means that you should be able to get up to a 4% improvement. If I use a 1" larger diameter rim, that also results in a reduction - about 5%. If I use a higher aspect ratio, that results in a reduction of about 2%. Combining these: A common rule of thumb is that if you want to go up 1" in rim diameter, you need to go wider 10mm, and reduce the aspect ratio by 5 (in order to get the same overall diameter) and the result is about a 5% improvement! This seems counter-intuitive to me. I would have thought that there would be a slight increase in RRC. The only explanation I can offer is that the data does not include many tires with lower aspect ratios. Notice that lowest aspect ratio in the data is "60" and there is only a single data point!. The data also has no rim diameters over 16". So the above example would be an extrapolation (that is, outside the range of the data) and I would urge caution if others do this as well. Let's try a different example - one where the tire size gets larger. Many folks have pointed out that wider tires increase aerodynamic drag - and that is true. For those who care, I am "CapriRacer" in this thread. I made a couple of mistakes in the calculation presented. First is that I overestimated the effect width had on RR. As you saw above, the effect is about 2% (not 3%) for every 10mm - and it is a decrease in RR. This, of course makes the effect of width a little less dramatic, but directionally correct. 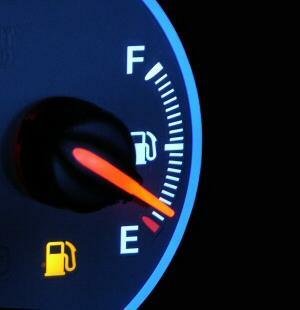 Bottomline: Increasing the width of a tire has beneficial effects on fuel economy. The above study is based on the only data I know exists on tire sizing and its affect on RR. I would urge anyone who reads this (and has the ability) to duplicate the study to confirm (or deny) its validity. I would also urge caution concerning the affect a wider tire would have on traction, hydroplaning resistance, and wear. These are things that have not been well studied - at least in the context of improving rolling resistance on a given vehicle (that is, same load). I also think caution should be used going too far from the range of the data. While I have confidence the data is pretty typical of a given tire line (excluding my reservations about OE tires) the r2 value is kind of low and extrapolating the data would increase any error already present. And lastly - Keep in mind that the range of RR values within a given tire size is HUGE! - While the changes due to tire size are small. I would suggest that careful selection of a make and model of tire would pay much larger benefits compared to changing wheels to accommodate a potential improvement due to tire size.